Barely out of college, Rock (Sam Concepcion) and Tracy (Tippy dos Santos) are getting married as a result of teenage pregnancy. Her mother (Zsa Zsa Padilla) does not agree because she thinks it will just be a repeat of what happened to her and her husband (Gary Valenciano), who actually wants the marriage to take place in order to save face. Rock's father (Ogie Alcasid), a one-hit wonder composer, is also cool with the idea, too bad his wife (Eugene Domingo) does not share the same sentiment. 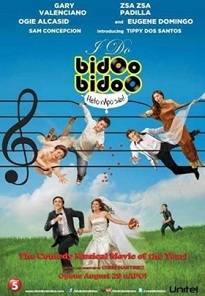 Telling their stories through various songs from the APO Hiking Society, I Doo Bidoo Bidoo is one enjoyable movie that serves as a genuine musical treat while also tackling an issue that is as relevant as it is timely. Every time one hears the cue for yet another musical number, it is met with momentary awkwardness that is quickly replaced by a smile and an inexplicable shiver down the spine, maybe because you grew up listening to these songs that remind you of an era when Original Pilipino Music did exist, and was not yet characterized by the brain drain the industry is experiencing now. This movie might seem to be an excruciatingly dragging music video about marrying young, but because of these songs that effectively reflect the emotions of the characters, you have no other choice but enjoy, and perhaps sing along if you are not that shy. Concepcion and Dos Santos might be unknown faces in mainstream cinema, but these two are ubiquitous in the theater scene, and they never fail to deliver. It is good to see them get a break in another medium, but in this case it is the producers that should be thankful because casting them has been a very good decision to begin with. Not only can they sing, but they could also dance well. In terms of acting, they would probably need some adjustment because the style used for theater and movies are sort of distinct, but in this movie they do just fine, and their song numbers are more than enough to compensate. The biggest surprise would be Alcasid, who has good acting chops after all, particularly in that scene in the van where he just explodes after a heated but rather funny confrontation. This is his first film where I actually had to praise him, given that the other movies I have seen him in, he was always trying hard to be a woman, or portray a woman, which he simply does not do well. He excels in drama, maybe he should consider a career shift, and stop cross-dressing, for heaven’s sake. Padilla also surprises some people, which in itself is a surprise because she has always been a good actress. Perhaps people just got so used to her as a singer, that each time she does some acting projects, people give her the credit that she deserves. Her rendition of Tuyo Na’ng Damdamin is one of the highlights of this film. Valenciano could not have founded a better film project to end his 17-year acting hiatus. Although his exposure is considerably less, he sings several songs in here which do make their mark, specifically his rendition of Paano, where his signature vibrato is ever so prevalent. Domingo is no singer, but as the nagger of a mother who only wants to best for her son, she manages to hold her own against a full cast of singers. She is also the source of most of the comedic bits in this movie, ably supported by Frenchie Dy and Sweet Plantado. It is always an enjoyable moment when the three share the screen. Their dance number in the mall was kind of awkward, but tolerably funny nonetheless. Back to Eugene, his most talked about intimate scene with Alcasid, where she sing Hindi Na Natuto, is arguably the most hilarious part of the movie. This is the most enjoyable Pinoy movie I have seen this year.